From earlier in the week…this one was a doozy and somehow so unsurprising. 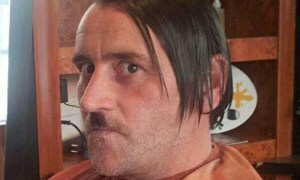 As thousands-strong anti-Islamization rallies make headlines in Germany following the Charlie Hebdo attack, one of the rallies’ organizers has resigned as leader of a right-wing group after a newspaper published a months-old selfie of him posing as Adolf Hitler. The photo shows Lutz Bachmann, leader of PEGIDA, which translates in English to Patriotic Europeans Against the Islamization of the West. It appeared Wednesday on the cover of German tabloid BILD. “I apologize to everybody who has felt attacked by my online postings. They were comments made without serious reflection, which I would no longer express today. I am sorry that I thereby damaged the interests of our movement, and draw the appropriate conclusion,” Bachmann said in Dresden. 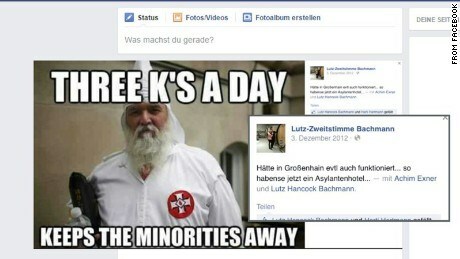 Bachmann also posted a photo of a Ku Klux Klansman. The selfie was an act of satire, his spokeswoman Kathrin Oertel said on Facebook. While every citizen has the right to engage in satire, she wrote, insulting foreigners is not satirical. Though Bachmann apparently has deleted his own Facebook account, screen grabs published by numerous media outlets suggest Bachmann posted the Hitler photo in September, while the KKK image is from 2012. Thankyou Master Khan, the sweet memories bring tears but time is a healer. She is now with Allah the Most Merciful, Kind. We all have a clock and one day that clock will stop, but only Allah knows when. At least they show some honesty in the above case. Indeed a sad time, but that sadness is a reflection of how much of a blessing she was to you and how much of a blessing your memories of her will be in the future. My deepest condolences… Wishing you the best and your family. Sorry to hear that Sam. May she rest in peace! Much love to you and your family. So sorry. One very bad event to have to go through. Take care. Are we covering Israel’s efforts to block ICC’s inquiry into finding Israel guilty of war crimes? My kids miss the snow, the most, about the US. May Allah give her place in Jannah and give your family sabr, Insha’Allah! Hi, it’s been a sad time for me lately with my dear mother who passed away suddenly.